for Macadamia Haircare. Macadamia oil contains the highest amount of Omega 7 than any other nut oil. Omega 7 most closely resembles human hair sebum and thus mimics the scalp’s natural oil production. It is lightweight and non-greasy with no build-up. The line is free of harsh sulfates, and are color-safe, paraben-free, gluten-free and cruelty-free. 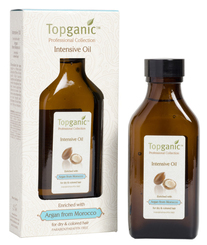 The products contain a Pro Oil Complex, a unique blend of Macadamia and Argan Oils to nourish and repair hair from the inside out. I’ve loved every product I tried. My favorite is the Nourishing Moisture Oil Spray. It can be used on both dry and wet hair. It is an ultra fine mist that instantly absorbs in the hair. It adds major shine and softness, without the greasyness and weight of most shine sprays. It also offers uv protection. So go nutty with Macadamia hair, and have the refined results you desire …. or get with it, Topganic. I have written about their Hair Mask, and now I want to tell you about their Leave on Silk Serum with Brazilian Nut Oil. It is made with Keratin Protein for Intensive Repair. It gives major manageability and tames frizz. “This flawless recipe is enriched with Brazil nuts, which are known as one of nature’s best sources of selenium, an important mineral for healthy scalp appearance. Brazil nuts are also brimming with alpha-linolenic acid, an omega-3 fatty acid that helps condition your hair. It is also considered a terrific source of zinc which a deficiency of, may lead to hair shedding.” There are lots more goodies going on here, check out the site to read more. So get with Topganic, that hair needs to be strong enough for some serious pulling…..